The Shih Tzu is rumored to have been a companion of Buddhist Monks in Tibet. Now he is a tiny canine who has wormed his way into our homes and hearts. Shih Tzu dogs are certainly here to stay and if you want one, have one or just want to know more about Shih Tzu’s and their huge hearts read on. Buddha Manjusri the God of learning is said to have travelled with a small canine companion, a dog with long hair around his head, resembling a tiny lion. Common folklore states that the dog was witnessed transforming into a full sized lion, hence his feline title. That exact little lion dog is stated to be the ancestor of the Shih Tzu we share our lives with today. The Shi Tzu is classed as a toy breed. He looks similar to a Lhasa Apso another small dog originating in Tibet. In fact it is thought, by some, that the Shih Tzu is a cross between a Lhasa and the Pekinese. He is also assigned the status of being an ancient breed and a dog who shares most of his DNA with the wolf. 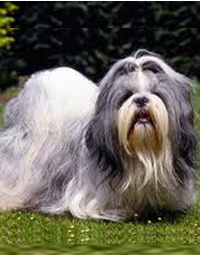 If full coated the Shih Tzu has long and silky hair. The soft hair will not shed but continue to grow. For this reason he is often recommended as a pet for people with allergies. Within dog show circles the Shih Tzu, purely due to his long and perfectly maintained coat, looks completely different to his pet cousin. As a pet, if a guardian has little time for coat maintenance which can stretch to hours every day, the dog will need clipping every two to three months. Without coat maintenance he could easily become knotty and uncomfortable. With his snub nose and large eyes the Shih Tzu is an exceptionally cute dog. However, the same characteristics that make him endearing have also caused him problems. Like many small dogs the Shih Tzu has, in recent history, became victim to unscrupulous breeding, he is a common dog to be found on Puppy farms and in backyard breeding establishments. Anyone who is looking for one of these little dogs needs to thoroughly research about Shih Tzu breeders before finding, and deciding on a Shih Tzu puppy. Because of extreme breed standards and unregulated breeding the Shih Tzu, over the last few generations, has struggled with some specific health problems. These are issues that have been passed through bloodlines by irresponsible breeding and should be checked for by anyone choosing a puppy. • Eye problems because at one point they were bred to have big, endearing, eyes. Some cannot close their eyes or they suffer with entropies eyelids (The lashes grow into the eye rather than away from the eyeball) Dry eye can also be a problem. As with other breeds there are responsible breeders who are gradually trying to bring the Shih Tzu back to his original health state. So if you are looking for a puppy please do research the breeder carefully. With a lifespan of between 10 and 15 years a healthy Shih Tzu dog will be around for a long time to come. Some small breeds can be yappers or even snappy. Some are not interested in walks in the rain. Some are not interested in walking far at all. But not the Shih Tzu, Bold and friendly, this toy breed has the nature of one much bigger. A healthy Shih Tzu who is raised with kindness will fit into almost any home with no problems. He does not need a huge amount of exercise and will be happy with an hour a day or maybe even less. He can live with any age from young children right through to elderly people. Much like any other dog, without proper guidance and social learning, he can become peevish. Because of his size, and cute appearance, he is a candidate for spoiling. A Spoilt little dog can indeed become snappy by conditioning. But If the Shih Tzu is raised well and treated like a dog, rather than the toy he can appear as, then he will be a hardy and fun little friend for children and adults alike. Overall, the thing you need to know about Shih Tzu dog is, if raised well and treated kindly this little lion dog is easy to handle, to walk, live with, train and have in your life. The Shih Tzu is rumored to have been a companion of Buddhist Monks in Tibet. Now he is a tiny canine who has wormed his way into our homes and hearts.